Would You Take $1 Billion Dollars, But Only Two Years To Live? I was asked an interesting question at a wealth mastermind a few days ago and it really got me thinking. The questions was, “Would you take one billion dollars in exchange for only 2 more years of life”? The second question asked was “Would you take one trillion dollars in exchange for only 2 more years of life”? I decided to survey my readers with the exact same questions and read their responses. Here are a few comments that people who would take the money left on the survey. I get asked a lot of times on how I got my start in the Internet marketing world to generate an online income. Well, that’s a story that goes back to 1996 when I was in my last year of college. I remember my sister telling me about this thing called the “Internet” that was getting real popular. Yup, what a serious misjudgment of epic proportions. I ended up getting my first email account a few weeks later through the college’s network and started to “dig” this new form of communication. I started communicating with my college buddies and ended up getting jokes forwarded to me. This was long before social media, so when you wanted to share something, you forwarded the email. Long story short, I ended up on some guy’s joke list. He would send out a daily joke to people who requested to get on to his list (it was all referral based and he didn’t even have an optin form). Before you know it, he ended up building a list of over 100,000 readers (and this was back in 1996). He started to include a “sponsor ad” before each joke of the day and had a small blurb letting people know that he was selling ad space. I inquired and asked him how much would it cost to sponsor one of his daily emails. He told me the cost for one daily ad would be $300 (which I thought was very reasonable). Now, it didn’t take long for me to do the math. This guy was making over six figures a year sending out a joke a day to his email list. I was in my last year of college and to get hired for junior accounting position at a $26,000 yearly salary was like hitting the jackpot. Yet, here was this guy making 4X that sending out a joke to his email list each day. You see, this guy had built an audience. He built his tribe of raving fans. He probably would have made a lot more money promoting affiliate products rather then selling ad space to 3rd party advertisers. But there were very few affiliate programs back in 1997 and advertisers were paying big bucks for advertising. That’s when I jumped online and started my own entertainment email list, sending out useless facts to anyone who was interested. In fact, I remember making my first $3 affiliate commission promoting a finance CPA offer to that list. I walked into my job (that I had at the time) waving that $3 check telling my buddies that I was making money online. They all laughed and couldn’t believe it. Sure, $3 ain’t that much, but proof of concept was there. Anyone could make money online. It’s crazy how much has changed 20 years later, but one thing that has stayed steady is email marketing plays a vital role in most businesses online. If you haven’t started building your own email list, your tribe… what are you waiting for? You might not know this, but I actually started my first business as a teenager back in the late 1980’s. It started when I came across a full page sales letter ad in a popular magazine taken out by an individual by the name of John Wright. The sales letter was written using blind sales copy (meaning that promises are made, yet you’re not quite sure what business you’ll be getting into). It was for a book that would explain exactly how this business worked and it only cost $12.95. So I ponied up whatever I had as a young teenager and sent a check by snail mail to get the book. 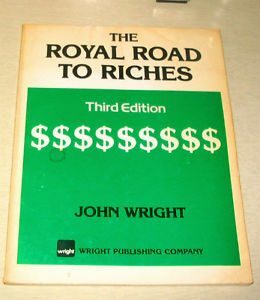 The title of the book was “The Royal Road To Riches” and I still have it here on my bookshelf as I type this email. It took about a week to receive the book and I still remember ripping open that brown envelope to start reading the book. The premise of the book was that “information” will always be in demand and if you can provide valuable information that the market wants, you can make a lot of money. I loved the concept and decided to sell information by mail in the form of reports and books. This first and only attempt at selling information by mail (mail order) was a complete disaster because I simply didn’t have enough capital to get it started. Remember, I was a broke teenager and this was a decade before selling information on the Internet was even possible. Fast forward to today and thousands of marketers have made huge amounts of money selling valuable information online. The ability to take instant electronic payment and provide instant digital deliverability had changed the game for many marketers including myself. Although “The Royal Road To Riches” didn’t work out for me initially, the concept always stuck with me and I finally released the my success with this concept a decade later. One friend of mine, Mark Ling, has made millions of dollars online selling digital information in dozens of different markets. He is a master at selling information online and has created a 6-step master plan on how you can follow his footsteps and earn income online selling information in weird little niches. But he is careful to explain that it’s not only information that he sells, but rather something more unique. It’s a free download and a quick read.